The Lambeth Country Show is in its 40th year and is on this weekend, if you hadn’t noticed. We never miss it, even if we are in our wellies trying to traverse the acres of mud. This sunny year (with showers) we discovered the amusing vegetable sculptures (how do they come up with the ideas), homemade cakes, worthy tents about health and community groups you might join or support which are all the usual fodder. But this year we also found a wealth of food and drink tents to tempt us even though we thought we were feeling too hot to eat. We passed by French and Grace and the Koi Ramen tents as we have already reviewed them and tried the Food Hall which had many cupcake stalls, a sprinkling of mango juices as well as sauces to add to anything to make a boring meal sparkle. Mango spicy sauces in various heat strengths, lime coriander and chilli sauce, and many others …. too many to recount here just visit them on the three stalls in this tent. I stopped at a stall selling hot Caribbean food – Dreens – who have curry goat, jerk chicken and fried fish – all with sides (rice and peas, festival coleslaw), corn on the cob and fruit salad. 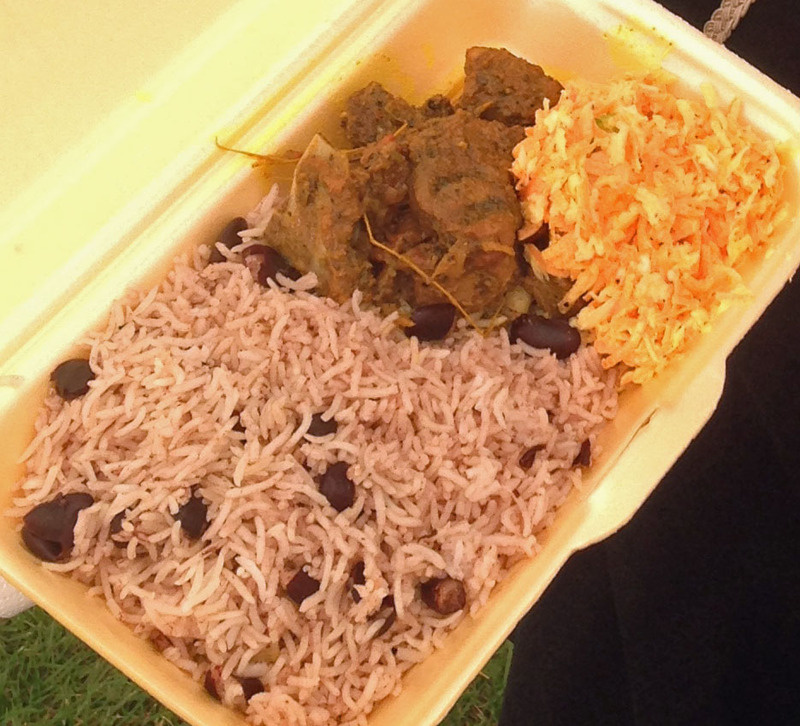 I chose the meal deal – goat curry, rice and peas and coleslaw. A hearty amount too. The goat was really well cooked, still on the bone but very easy to eat with a flimsy, plastic fork. It was really well spiced and not so hot that there was no subtlety to the individual flavours which included fresh thyme. The meal deal was £7.00 reduced from the menu price of £7.50 and well worth it – we shared it between two people. 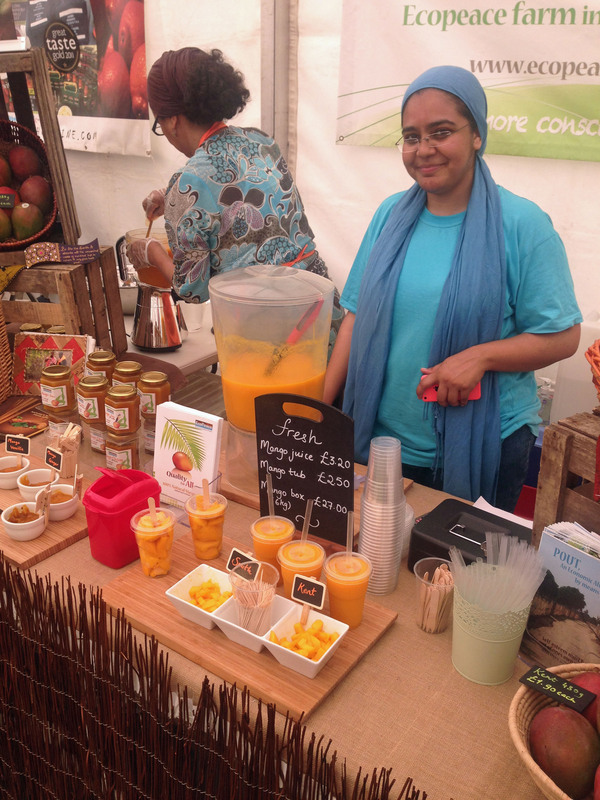 Dreens also serve beetroot, carrot and ginger juice, or apple, celery and kale but I chose some freshly made mango juice – from Senegal – Ecopeace. It was thick and very sweet and more a pudding than a refreshing drink but you feel worthwhile providing the support to this group who we have seen before at LCS. It also cost £3.50 a cup so not for the short of change. We are writing this post-haste so you can all get down tomorrow (Sunday) and try the delicious options. 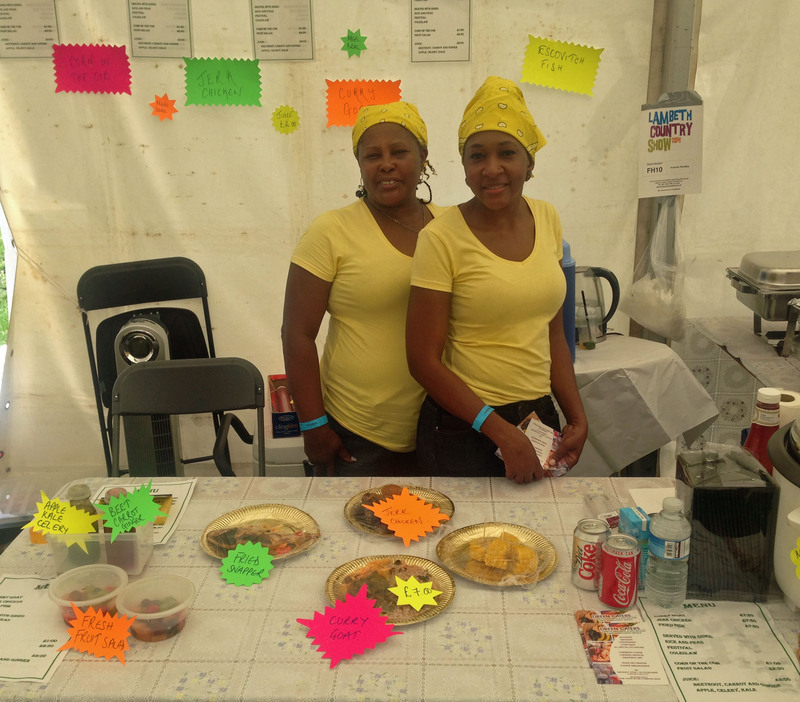 There are a lot of jerk chicken stalls reflecting our Lambeth culture and so any that are great please let us know – especially if they are to appear again in Brixton. But also take a walk around the country show – do see the Big Stage and the camels in the arena but also stop and provide some support for the Lambeth Time to Change campaign which is working to reduce discrimination and the stigma of mental ill health.